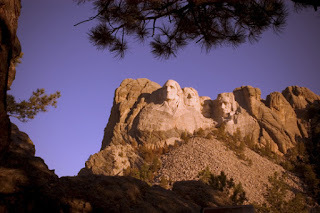 The carvings on Mount Rushmore are best photographed in the morning. The heads face southeast, so receive sunlight best from sunrise through approximately 10 am. Sunrise can give the faces a pleasing orange or golden cast, but time of year has a large effect on shadows that form on the mountain at that time of day. 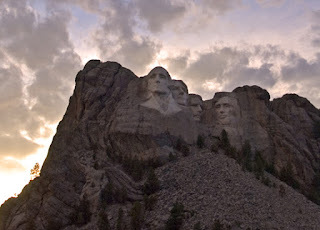 Mid-summer sunrise will cast a shadow from the Lincoln head that will completely cover Roosevelt's face. In early winter the sun has moved far enough south to eliminate the shadow almost completely. 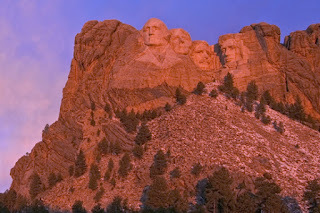 (Above) is an early June sunrise with Roosevelt's head completely shadowed, while (below) is a mid-December sunrise with all four heads lit evenly. Late afternoon and evening places the heads in full shade no matter what time of year you visit (below). You may see postcards with a colorful sunset behind well-illuminated heads, but you can also bet that those were not done in one standard-technique shot. 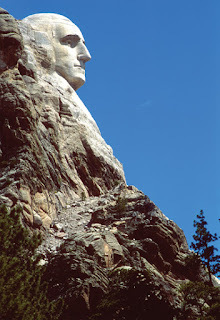 - The profile of Washington's head can be isolated against the sky at a turnout on Highway 244 about 1/2 mile west of the main memorial parking area (below). 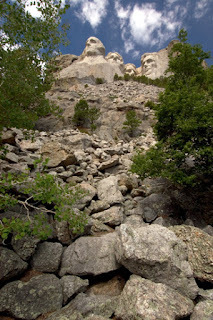 - The Presidential Trail, which makes a loop from either side of the main viewing platform, leads to the bottom of the rock rubble pile below the faces. This gives the mountain carving a grand "monumental" feel as you look steeply up at the faces (below). 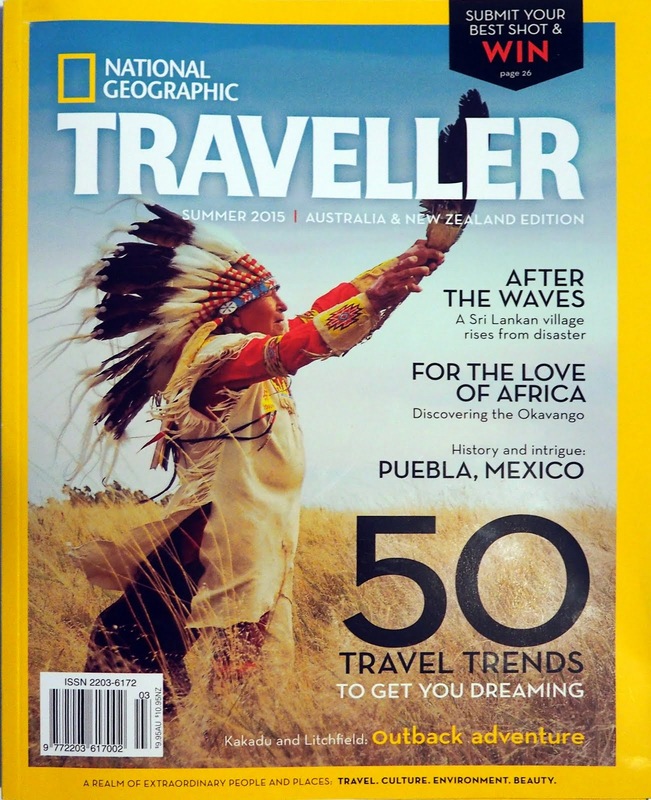 - If you took the left side branch of the trail from the viewing platform, just before you reach the rock pile you will see a short staircase leading downward to the left. It leads underneath two huge boulders leaning on each other. Through the crack between them you can frame Washington and Lincoln's head. - A short walk past the boulder crack (or at the top of the steep staircase climb if you started from the right side of the viewing platform) is another short staircase leading upwards to the left. Rounding a large rock you will come to what the park rangers call the "Hot Tub Terrace," evidently because it would be an ideal spot for a backyard spa. There is an aspen tree here that provides some nice foreground contrast to all the rough granite piled around it. The tree also creates one of the few places to shoot fall colors with the faces at the appropriate time of year.